Explanation: On September 1, Aurigid meteors filled the sky, in keeping with inovative predictions of an outburst from this historically tentative meteor shower. 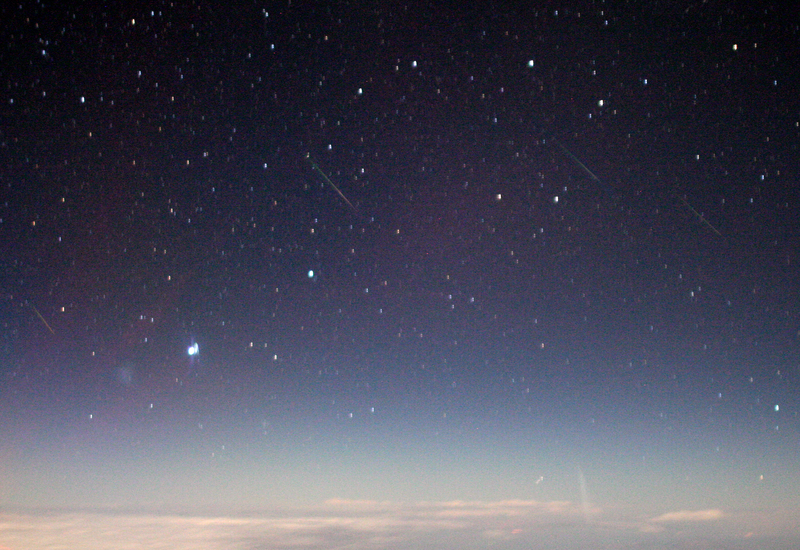 Astronomers flying at 47,000 feet on a dedicated mission to observer the outburst collected image data for this composite photo of the Aurigids' bright and colorful streaks. The source of the shower is understood to be Comet Kiess, a comet that would have last swung through the inner solar system around 2,000 years ago. Influenced by gravity, dust from the tail of the comet has been drifting toward the Earth's orbit ever since. Predicted to pass through a clump of dust this year creating the 2007 outburst, Earth has also passed through dust clumps from this comet in 1935, 1986, and 1994. Of course, the shower's radiant point is in the eponymous constellation Auriga, the Charioteer.